NOTE: if you do not wish to use Paypal you may purchase this Book by sending a EURO cheque to OaC, Spanish Point Rd., Miltown Malbay, Co. Clare, Ireland. Your Book set will be dispatched as soon as the funds have been cleared through our Bank account. Kilrush Poor Law union encompassed a large area of the south-west of County Clare in the 19th century. The union achieved national notoriety during the Great Famine in Ireland due to the very high level of poverty, hardship, hunger, destitution, famine-related diseases and deaths among its population. A primary cause of those distressed conditions and of the union’s notoriety was the extraordinary level of mass evictions that occurred there during the Famine years. County Clare had the highest level of evictions, relative to its population, of any county in Ireland during the Great Famine and Kilrush Poor Law union had the highest level of mass evictions in Clare. 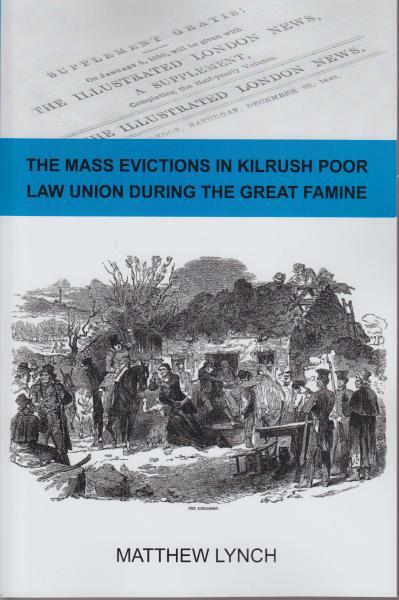 This book presents, for the first time, a detailed analysis of the context, course, causes and consequences of the mass evictions in Kilrush Poor Law union during the Great Famine. It describes the pre-famine community and land-holding patterns, the onset and progress of the mass evictions. It identifies the main evictors, the numbers evicted and their locations. Context and perspectives are examined by reference to other mass evictions in other places and at other times. Extensive contemporary accounts of the Kilrush clearances are reviewed, including the many iconic images from the pages of the Illustrated London News. The causes of the mass evictions and the aims and motivations of the evictors are examined and assessed. The historically-contested issue of responsibility for the evictions is addressed. The book concludes by describing the social, economic and political consequences of those traumatic events, including the elimination of a vast number of small land-holdings, the associated permanent disruption of the social structure, the relative insignificance of emigration as a significant relieving factor and the dismal fate of the dispossessed. Matthew Lynch is a native of Kilmurry Ibrickane, Co. Clare and a graduate of the University of Limerick’s MA programme in History and Local Studies. He has published several papers on local history in counties Clare and Tipperary. He was co-editor of Clare History and Society, a set of interdisciplinary essays on the history of County Clare.